This Christmas we went and stayed with John's grandfather... otherwise known as the man who has everything. So, choosing a gift for him was somewhat difficult. 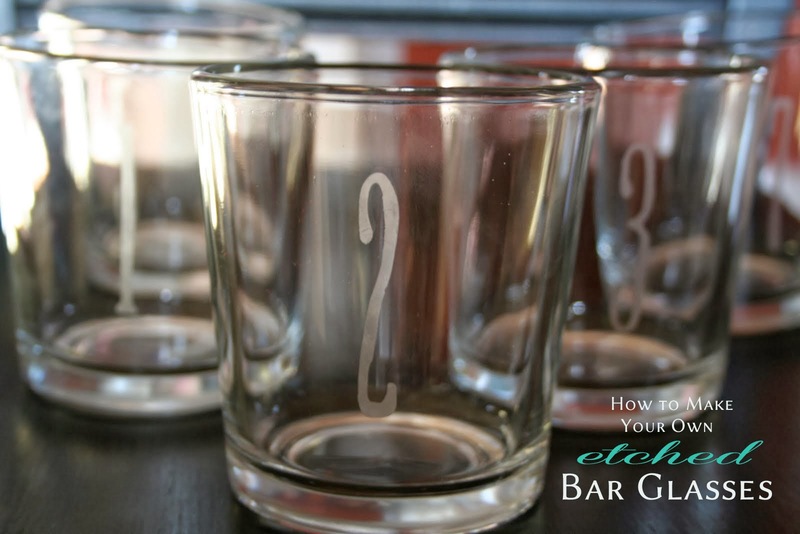 But, knowing how much he enjoys his 5 o'clock cocktail hour, I was inspired to make these etched bar glasses for him. I etched a number on each glass so that there's no question of whose glass is whose. Unless, of course, you've had so many of those cocktails that you can't read the numbers... but, that's another problem, right? Gather your supplies - I bought my plain glasses at Big Lots (set of 8 for $10). 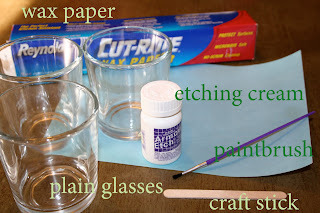 I had some etching cream on hand, but you can easily find some at your craft store. I also happened to have some self adhesive vellum, but you could use regular vellum or even sticker paper. 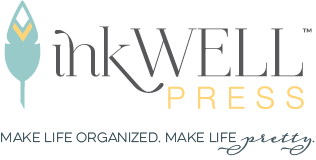 Plan your design - I used my Cricut to cut out the numbers, but if you could always find letter or number stickers (in the scrapbooking aisle at your craft store) and use those. Cover your workspace with wax paper to protect it. Then, using the negative space around the number, place it on your clean glass. Use a craft stick to burnish all the edges really well so you can have crisp numbers. *If you don't have self-adhesive paper, then use some repositionable spray glue on the paper - that will get it to adhere just enough. Apply your etching cream making sure to apply a liberal coat. Follow the directions on the jar... mine said to let it sit for 5 minutes, but I let it sit for 10 minutes. Rinse off with running water. Should I be wearing gloves? Probably, but I like to live dangerously (don't tell my mom). And, just allow them to dry. I LOVE the way these turned out... so much that I'm thinking of doing it to the feet of my wine glasses instead of using wine charms. look at you! what a neat idea. i will definitely have to bookmark this when i'm in need of a new gift. who wouldn't love them??? So THAT'S how they do it! You are so good with DIY! I just LOVE this idea, and what a great personalized gift! My aunt did this with her wine glasses and butterfly stencils (her husband let her because he doesn't drink wine... so didn't mind the butterflies!). Job well done! Oh wow!! such a fab idea.. Loved it!! I'm saving it .. and will attempt doing this for a few occassions... Thanks for this!! Love them! But I do love the fun font that the cricut provide. They look like you got them at pottery barn. Would have never thought of the numbers idea! Thanks for sharing! Love this idea! I didn't even know that etching creme existed. FUN! Tonya, they really turned out beautifully!! I think this is perfect especially these days that Christmas is almost here. This is the best choice if you don't have any gift ideas until now.